One could argue that the cistern size is the key to rainwater harvesting. 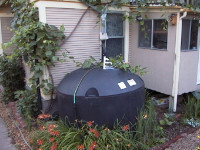 The bigger the tank, the more rain can be stored for use on days when it is not raining. But we also think it is possible to have too much storage particulary, if the tank is not getting depleted between rains. In that case, there will be overflow, which is a waste of harvested rain. Our recommendation is that people always look at the usage requirements between rainfalls to get a sense of the amount of storage needed. That is why we are trying to standardize on 200 liters of storage. For a family of 4 drinking 12 liters a day, a full 200 liter tank should last 16 days. As long as it rains after those 16 days, there should always be some rain in the barrel for them to drink. Under normal conditions, rain is usually no more than a few weeks apart once the rainy season has begun. In fact, during our prototype testing in the Bay Area this past Winter, the longest dry spell from December to March was only 12 days.